Endometrial stripe is the covering of the uterus. 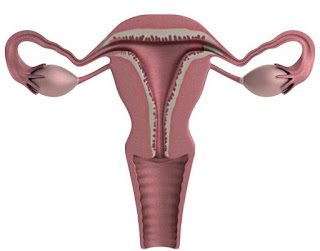 It is the mucous membrane which lies around the uterus. It is called as endometrial stripe because it appears as a black or dark stripe in transvaginal ultrasound. The thickness and size of endometrial stripe matters a lot in diagnosis of endometrial abnormalities in women associated with specific signs and symptoms. The normal thickness of the endometrial stripe is 1 to 15 mm in child bearing years while it extends to 14 to 16 mm in thickness after ovulation. The endometrial stripe is of great importance regarding women fertility cycle. During pregnancy, the endometrial stripe becomes thicker and a routine checkup regarding its thickness is recommended. The normal size of endometrial membrane varies in different conditions. Like during menstruation the normal size range is 2 to 4 mm. then, at early proliferative phase the normal size is 5 to 7 mm. likewise in pre-ovulatory phase the normal size is 11 mm and in secretory phase the normal size is 7 to 16 mm. These all values are average values of thickness of endometrial stripe. The thickness of endometrial lining varies from individual to individual in different cases. The endometrial stripe thickness 4 mm is considered normal in both pre-menopausal and menstruating women. Mostly the normal size reported during menstruation period. The increase in thickness i.e. above 4 mm in menstruating women shows the abnormality in endometrium along with the symptoms associated. If the endometrial stripe thickness increases from 4mm, there may be irregular periods, heavy periods (because of greater mass to dispose of), severe pain may be experienced by the patient. The thickness can be measured by transvaginal ultrasound. In case of increased thickness found in ultrasound, further investigations should be done to find cause. The size of endometrial stripe thickness in the 2nd stage of proliferation i.e. the 14th day (right after the regeneration period ends) is considered normal if it is 5 mm. In menopausal period, the 5 mm thickness of endometrial stripe is considered normal only if there vaginal bleeding otherwise it is not normal. The increased thickness of endometrial stripe in menopausal women may lead to cancerous conditions and malignancies. But the increased thickness of endometrial stripe (not more than 11 mm) is considered normal only if there is no vaginal bleeding in menopausal period. The measurement of thickness 9 mm is considered normal before the secretion period start. The 9 mm thickness of endometrial stripe is due to the involvement of two layers (walls). Doctors say that the 9 mm thickness at least is required for the transfer of an embryo. The thickness will increase above 9 mm when the embryo properly formed. This is not the same in all women, it varies in different cases. In the presence of a disease like cancer or malignancy the thickness of endometrial stripe will vary along with the severity.